Rohit Menezes leads The Bridgespan Group’s Mumbai office. His work has focused on philanthropy, youth development, and community revitalization projects and research. Among other things, he has worked with clients on issues related to growth strategy, program model, organization design and sustainability planning. 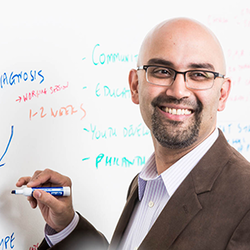 Rohit has co-authored several papers, including “Giving Back to India,” “Four Pillars of Growth in Youth-Serving Nonprofits,” and “Experiments in Next Generation Community Revitalization.” Previously, Rohit was a management consultant at The Boston Consulting Group and served in leadership roles in telecommunications businesses. Rohit has a BA from Williams College and an MBA from the Wharton School.